Born in Stawell in 1895, Harold Armitage was a son of Joseph Armitage and Mary Elizabeth Gilbert. Joseph worked with the railways as a fireman and by 1909, the family were living at Campbell Street, Ararat. They moved to Barkley Street and Joseph moved on to train driving. By 1914, the Armitages were living in Clarke Street, Hamilton. Harold served in the Senior Cadets and the Citizens Forces in Hamilton for two years. He was also a member of the Hamilton branch of the Australian Natives Association (ANA). Harold was working as a salesman when he enlisted on 4 August 1915, despite rejection at his first attempt due to his chest measurement. Harold left Australia eight months later. Before leaving, Harold gave his mother a code and told her if he cabled for money he would include the code. Then she would know it was a legitimate request. On arrival in Egypt, Harold joined the 15th Field Ambulance based at Moascar. On 19 June 1916, the 15th Field Ambulance sailed to France. The went to northern France where they remained until around November when they moved south to Becordel-Becourt. 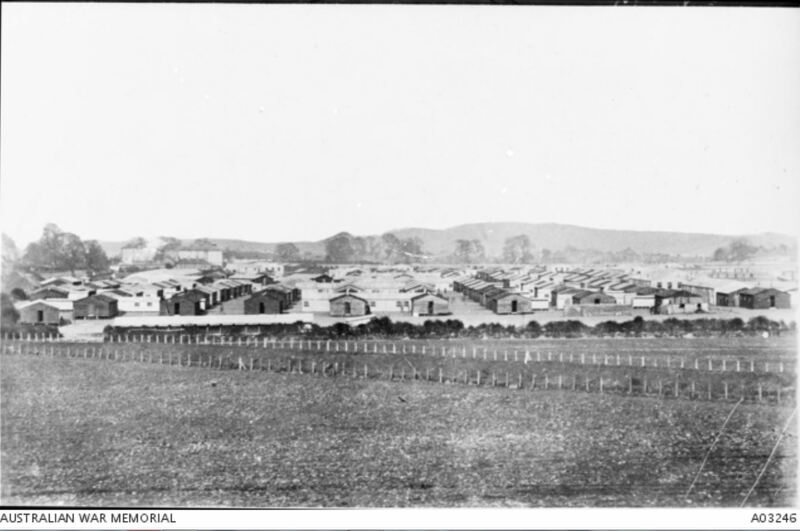 In that month, Harold fell sick with Trench Fever and was transferred to the 3rd Australian General Hospital in Brighton, England. After his discharge from hospital, Harold remained in England moving to the 16th Field Ambulance on 19 March located at Wareham, Dorset (below). During that month, he was AWOL for two days and received two days of Field Punishment No. 2 and forfeited seven days of pay. On 27 September 1917, Harold was invalided home due to rheumatism from his time in the trenches. He returned to Hamilton on 20 November 1917 by the Warrnambool train. Mayor Robert McLuckie and councillors were there to meet him at the station. Harold soon moved to Geelong and was living in Mercer Street. On 24 August 1918, Harold’s mother planted a tree for him along Hamilton’s Clarke Street Memorial Avenue. Harold married Doris Elizabeth Harvie in 1921 and they moved to Colac West where Harold farmed. They went back to Geelong, living in Keera Street while Harold worked as a travelling salesman. In 1924, Harold’s parents Joseph and Mary moved to Geelong, living in Latrobe Terrace and Joseph was still with the railways. Harold and his family spent some time living in Bendigo in the 1930s and Horsham. One of Harold and Doris’ sons Frank Armitage was a gifted artist and in 1949 he left Australia for Mexico and the United States, going on to illustrate the background scenery for some of the great animated films and cartoons including a host of Disney films and cartoons such as Mr Magoo. Harold died at Geelong in 1961 and is buried in the Eastern Cemetery.